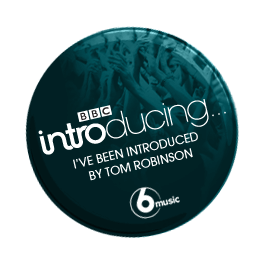 Yesterday my song Crossbows, included in The inner wastelands, was part of the last BBC introducing podcast, alongside other great tunes selected by Tom Robinson and his team. Click on happy Tom (below) to access the podcast. I´d like to credit the photographer for this picture ripped off from the BBC page, but I couldn´t find any credits, so here is the link to its origin. This is quite a thing so I spent a while looking in the mirror and congratulating myself feeling very proud. Then I realised that I still had a thesis to write and a tiny army of bacteria to fight, so I wrote some more music around the cosy radiator efficiently procrastinating from both. I have been given a shiny glittery golden star (only that it is green and round) aka e-badge you can click on to access the BBC page and a little space at the BBC page featuring all the social media links and next upcoming gigs.